The City of Lights is one of the most historic, not to mention, romantic tourist destinations in the world. 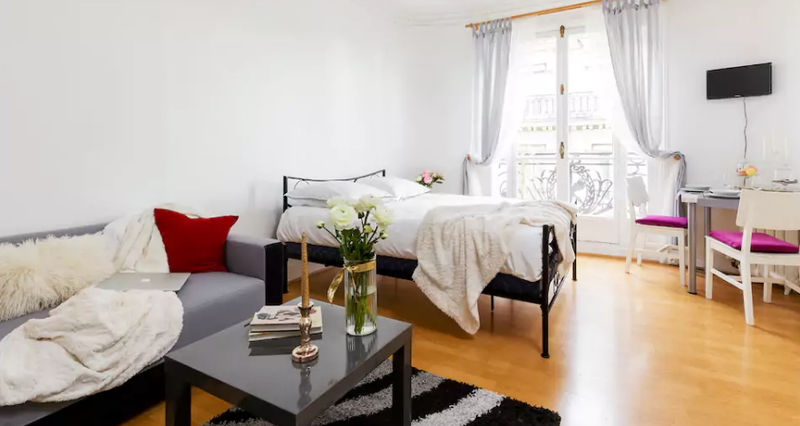 If you are planning a Parisian getaway soon and you’re thinking of booking a hotel, we have a better suggestion: why not rent a small apartment via Airbnb? 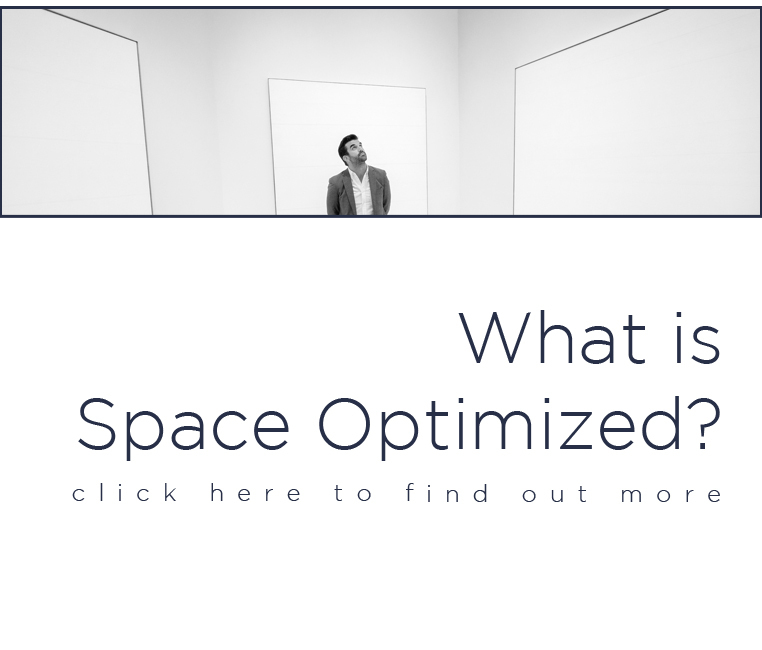 It’s much cheaper this way plus, you’ll enjoy a much larger space for yourself and your travel companions! Who doesn’t want a room with a view? This gorgeous flat sits just a few steps away from Paris’ most iconic landmarks! This small apartment is tastefully furnished with minimalist furnishings. It features one bedroom, a bathroom, and a kitchenette. The flat also comes with a small living area and a modest dining room. The best thing about this apartment? The balcony offers a great view of the Eiffel tower! The Champs Élysee, Arc De Triomphe Eiffel Tower flat can accommodate 2 guests so if you’re planning a romantic getaway real soon, book this one for only $87 a night! Planning to stay in the picturesque Montmartre district? Try booking this beautiful loft! This is the perfect apartment if you’re traveling with the fam. The Sloth loft sits in a vibrant neighborhood, surrounded by a serene, verdant courtyard! The bright interiors and stylish furnishings ensure a lovely stay. The 3-bedroom flat is equipped with a kitchen, multiple baths, and a dining room. The flat is situated close to restos and popular attractions! Book this fabulous loft for only $112 a night here. 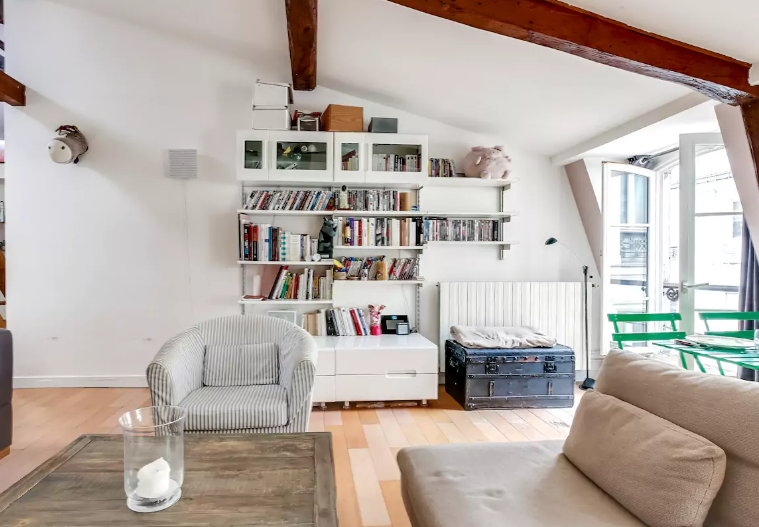 Located in a bustling neighborhood in the heart of Batignolles, this spacious duplex evokes the charms of a classic Parisian home. It duplex comes with a massive living room lounge, a dining room, a bedroom and a kitchen. There is a master’s bedroom that’s accessible via the spiral staircase and the bathroom has a bathtub and a shower room. This flat can accommodate up to 4 guests and is ideal for a small family. Book it for only 95 bucks per night here. Located in the heart of Paris, this charming flat features rustic, homey interiors, offering the real Parisian lifestyle experience. This is the perfect place for those who plan to do bits of sightseeing and shopping because the apartment is just a few steps away from Paris’ most popular attractions. In fact, the flat is just minutes away from the Le Louvre, the Le Marais and Notre- Dame! 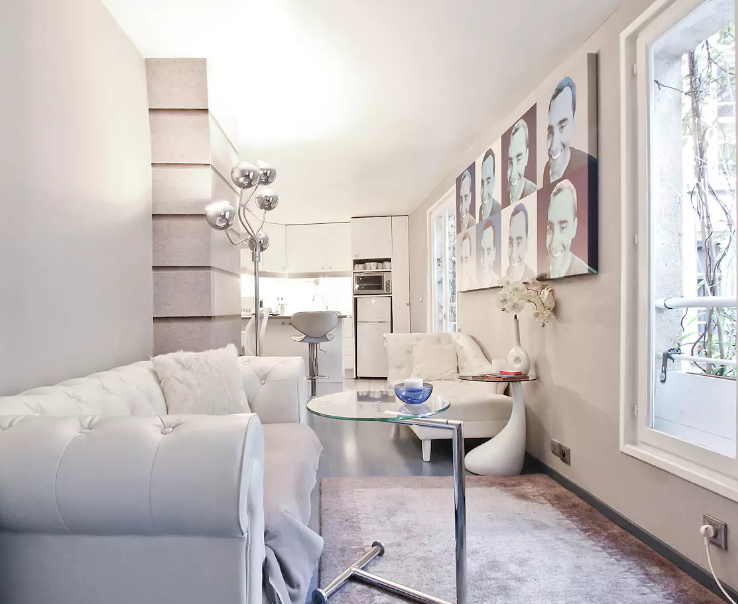 This rue de Rivoli small apartment is located on the 4th floor of a modern building. It boasts a sizable living room, a dining room, a bedroom, and a fully equipped kitchen. The flat offers a fabulous view of the surrounding courtyard + a small library. On your rest days, you can curl up with a good book or people watch. Book this apartment for only $138 per night here. 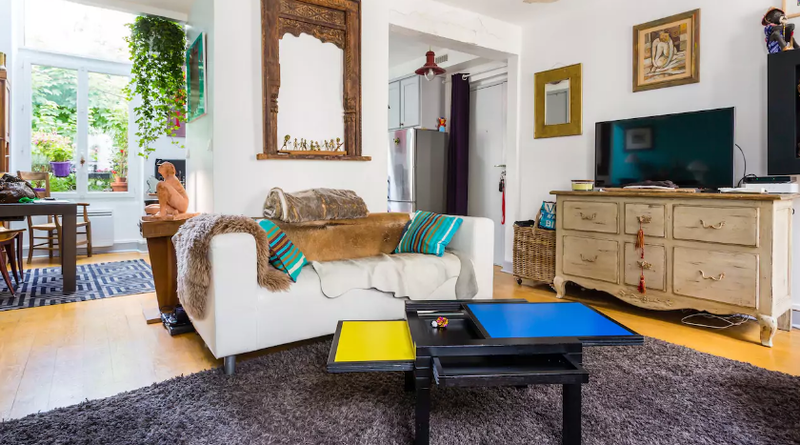 This bright, contemporary small apartment is located near the Beaubourg area and is perfect for those who’d like to do a lot of sightseeing in the Centre Pompidou and La Marais area! 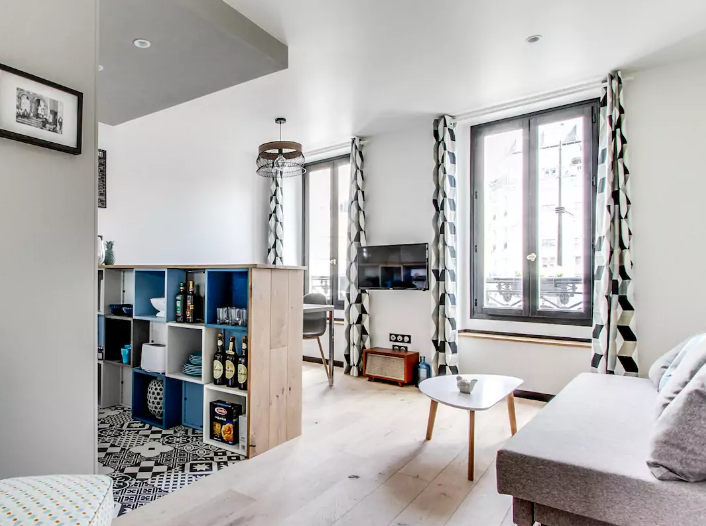 The La Marais duplex is just minutes away from the famed Georges Pompidou Center, one of the trendiest tourist spots in Paris, including the royal palace and the Louvre! This La Marais duplex overlooks a colorful yet peaceful courtyard. The first level features the living area and the kitchen. The second level features the bedroom and bathroom. The flat can accommodate 2 guests and is available for only $130 a night. Book it here. Come at home this a quintessential Parisian apartment! Located in one of the most romantic districts of Paris, this 258-square-foot flat offers an expansive living and dining area, a beautiful bedroom + ensuite bathroom. The high French windows showcase the serene surroundings beyond. There are a couple of balconies so you can check out the scene while lounging around! 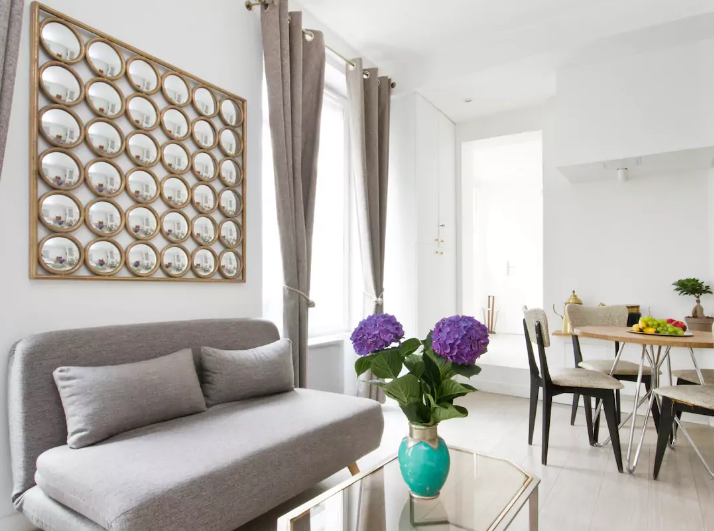 This Marais small apartment is located on the third floor of a 17th-century building so if you’re looking for history-filled accommodation, book this apartment for only $94 a night here. This charming studio apartment is located near the famed Passage Choiseul, an iconic passage in the Opera district. It’s just a few steps away from Paris’ most popular landmarks including the Louvre Museum! Step inside this modern apartment and you’ll be greeted with a sleek, all-white interiors. The flat comes with a queen-size bed, a sofa bed, a kitchen, and bathroom. Want to eat your way to Paris? Since the flat is centrally located, it’s just a few minutes away from local restos and patisseries! If you want to gain ten pounds during your Parisian vacay, book this modern studio for 97 bucks a night here. Going on a weekend getaway in Paris? We highly recommend this stylish yet comfy studio! The flat features striking black and red interiors. 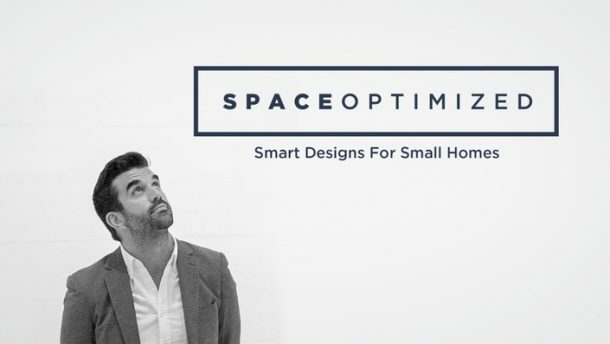 It offers a sleek bedroom as well as a bathroom, a small kitchen, and a modest living room. 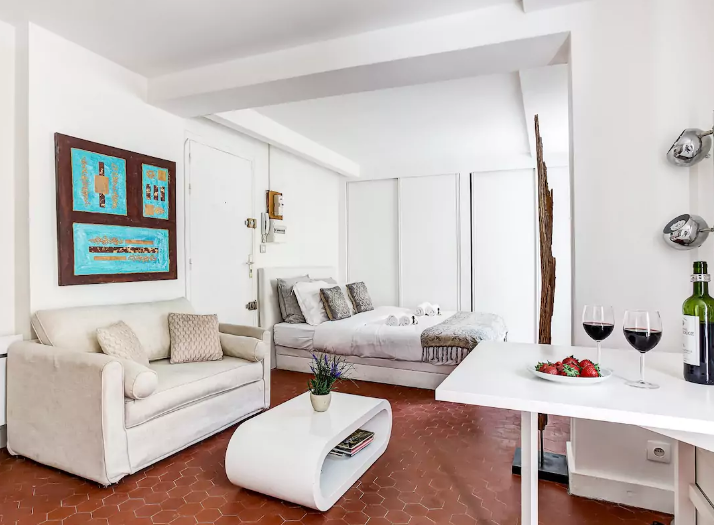 This charming small apartment is practically steps away from the Louvre museum so if you love art, check out this place! It’s centrally located so you don’t have to go too far to do lots of sightseeing and shopping. Book this $88 per night black and red studio here. 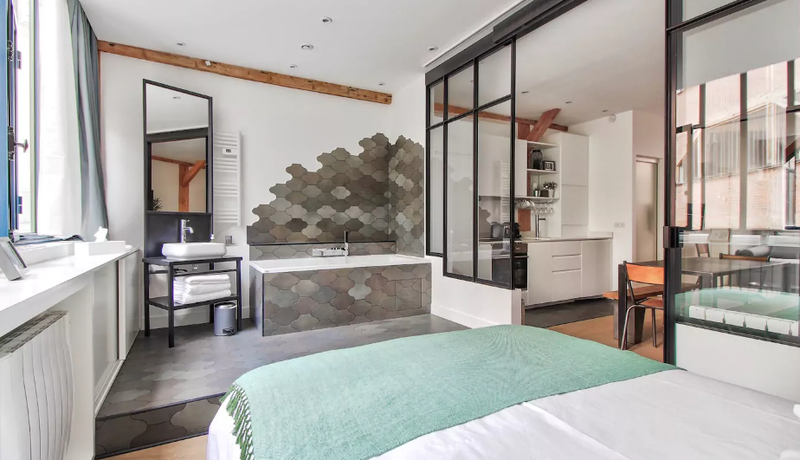 If you’re looking for another tastefully-furnished apartment in the La Marais area, check out this surprisingly roomy studio. 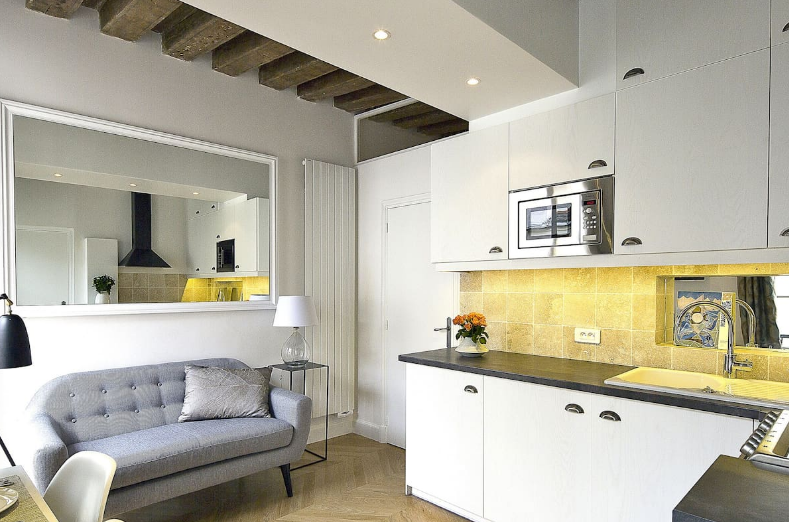 Located in the heart of Paris, this Marais flat offers a cozy living area, bedroom, and a fully equipped kitchenette. It also comes with a massive Italian shower area and separate toilets. Some of the most defining features of this apartment are the great open windows, which bring lots of sunshine! It’s a great place to take in the local scene and people-watch. You can reserve this lovely studio for only $113 a night here. If you’d like to book a stay in a new apartment, book this gem of a studio! This is a contemporary flat that can accommodate up to 4 guests. Set in one of Paris’ tourist hotspot, this apartment is just a few steps away from the metro’s trendiest restos and shopping centers. The apartment offers a modest dining area, a lounging area, beds, and a bathroom with a washing machine. It also comes with a kitchenette so you can prepare your meals in a snap. You’ll love the Scandinavian-style interiors and the striking tiled floor. There is also a small terrace where you can chill out while taking in the local sights. 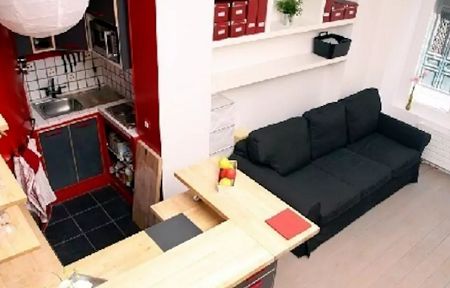 Rent this stylish apartment for only 62 bucks a night here.